We’re giving truck drivers the best pay, the best trucks, and the best experience. 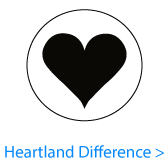 Heartland Express drivers are key to the success of our company. Our drivers are known to be some of the best in the business so we offer the most attractive driving positions, backed by a commitment to safety and better driver CSA scores, a commitment to keeping drivers busy and productive, a commitment to meeting home-time schedules, and the very best pay available.